I rather like the French name for this series of stamps – meteorlogical phenomena, though I guess we all 'wonder' at the weather. Is there a country that doesn't think they talk more about the weather than anyone else? These stamps were issued to coincide with the anniversary of 175 years of the first weather observatory. This beautiful set came out in June 2015. It was designed by Kostas Tsetsekas and feature the works of five different photographers from across the country. The lightning was captured in Manitoba by David Reede; the double rainbow was found in Quebec by Mike Grandmaison; the rare sundog, created by ice crystals in the sky was seen in Nunavut by Frank Reardon (that's the Arctic city of Iqaluit shown); in Alberta, Daryl Benson found some hoar frost; and finally, at the Cape Spear Lighthouse in Newfoundland, Geoff Whiteway was up early enough to see this morning fog. Amazing set. 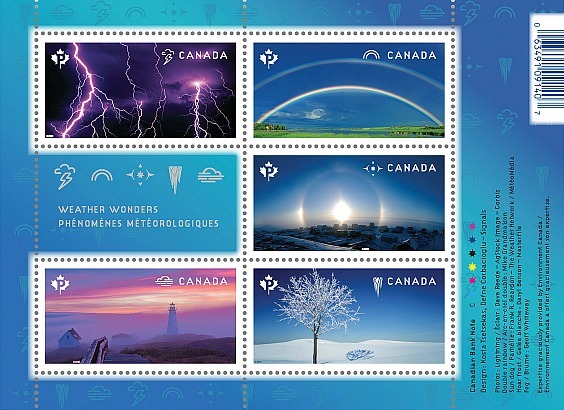 I love the bonus non-stamp,with the meteorological symbols. Yes, one day I'm going to have to break down and actually send these, but at least I get to keep that symbols non-stamp! (I'm afraid the link on the See it on a Postcard blog doesn't work). thanks - I fixed it! We see sun dogs every winter during clear, super cold days. They are not all that rare about here. The complete set is marvellous! I've received the rainbow, accompanied by the non-stamp. But the others are neautiful, too! I've never heard of, nor seen, sun dogs before. Must be intriguing to see, like rainbows, I guess? I'm always a little sad at the short life span of a rainbow; always wishing for just a few more seconds. A really beautiful set. Weather seems to dominate everyone's thoughts. We in southern Ontario certainly have it on our minds as we deal with snow, freezing rain, and heavy misty drizzle.